Chickens are one of the most popular birds to be domesticated. People, both in rural as well as urban areas, keep chickens for the fresh eggs they can get from them, and sometimes, even for their meat. 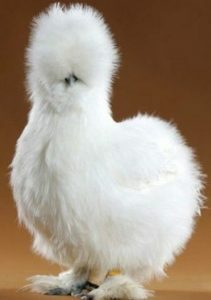 Silkie Chickens are one of the popular chicken breeds. They are the adorable, fluffy chickens with tufts of hair projecting from their heads. If you have been wondering about Silkies, and whether they will be a good addition to your flock, this guide will help you make an informed decision. The Silkie is known for its fluffy plumage that feels like satin or silk when touched. But this is not the only thing that differentiates a Silkie from the rest of the chickens. A Silkie is quite well known for its calm temperament, which is why so many people prefer it as a pet. They lay about three eggs in a week and are considered to be broody, as they are also kept to hatch eggs from other breeds of birds as well. Today, the Silkie is kept for an ornamental purpose and are also used to incubate the offspring of other breeds of chicken and waterfowl including geese and ducks and game birds like pheasants and quails. Silkies are also used in some cuisines. The black meat of a Silkie chicken is considered a gourmet food in several Asian cuisines including Chinese, Japanese, Korean, Cambodian and Vietnamese dishes. Silkie meat is used in broths, curries and braising. A standard male Silkie chicken weighs four pounds on an average while the female weighs three pounds. 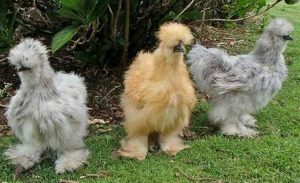 Silkies appear in a variety of colors ranging from blue, black, gray, white to shades of lavender and red. 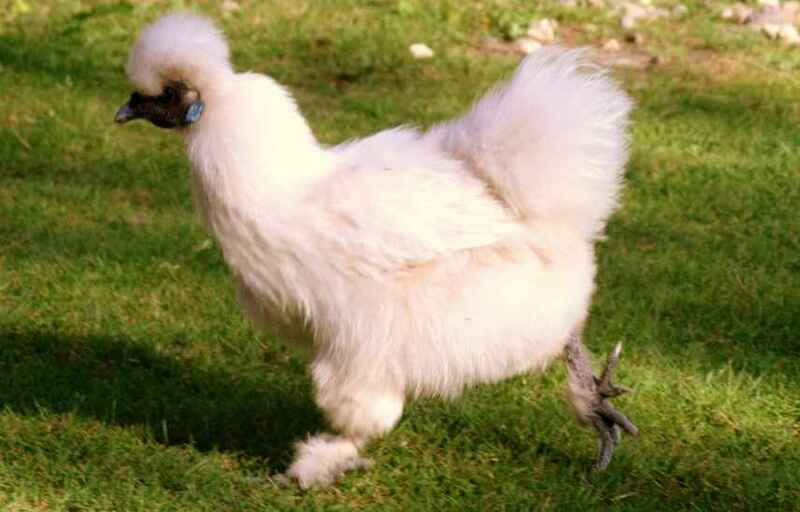 Silkies come in two varieties – a standard and a bearded version. The bearded one has, as the name implies, a beard. The beak of a Silkie could either be gray or grayish-blue in color. One of the most striking features of this bird is that it has earlobes that are turquoise blue. Also, their legs are feathered. The eggs of a Silkie chicken are cream in color. Silkie chickens have a lifespan of nine years. Silkies are extremely gentle by nature. They are also very broody and make wonderful mothers. They love to raise eggs, including those of other birds. 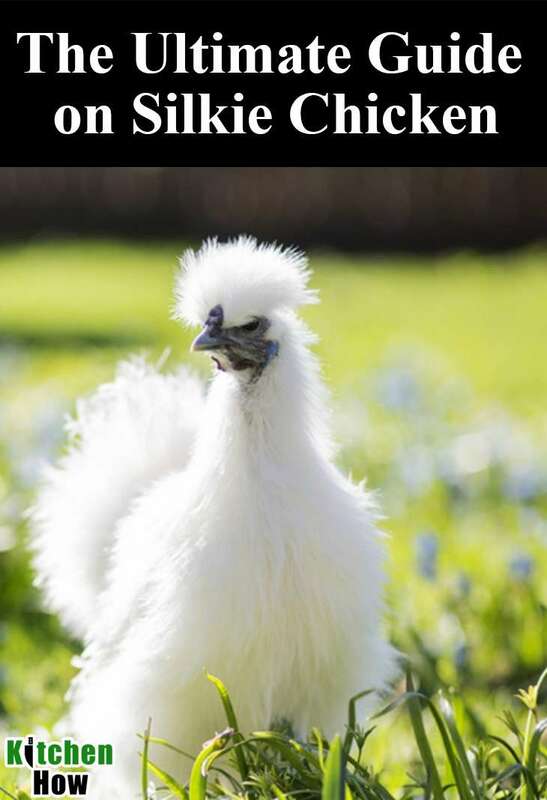 This is one of the reasons why Silkies are so popular with poultry farmers. Silkies are very friendly and love company, which makes them wonderful pets. They can tolerate heat quite well. Also, their downy feathers ensure that they cannot fly, so that is an added advantage for poultry keepers. Silkies are trusting by nature, so there is often the risk of them being bullied by other breeds when kept with a mixed flock of birds. The feathers of Silkies are similar to fur, as the barcibels that hold the feathers together in other breeds is missing in a Silkie. The feathers on a Silkie are not waterproof. So it is not advisable to house Silkies in a wet climate unless they are properly sheltered. Also, even though the plumage of the Silkies appears to be thick, it does not keep them very warm. This is why Silkies don’t do well in cold climates. Since Silkies cannot fly and are docile in nature, they need special care when sheltering and feeding. Silkies should be fed layer crumbles instead of pellets which are more convenient for a Silkie to eat. Silkies can be fed a mash of carrot, grated apple, and bran. It is also important to add grit to the feed, as grit helps the Silkie to digest their food.